Is this better? Jeez. For reasons I cannot understand the HTML program – GoLive, or StayDead, depending on your experience – refused to accept 550 pixels as the value for the table’s width. I’d type 550; it would revert to 74. I redid it cell by cell; no good. Until eventually it worked. Sorry about that. Monday and Tuesday have been redone, so they should work. All I can say is this: it looked fine in Safari and IE for Mac. Go figure. 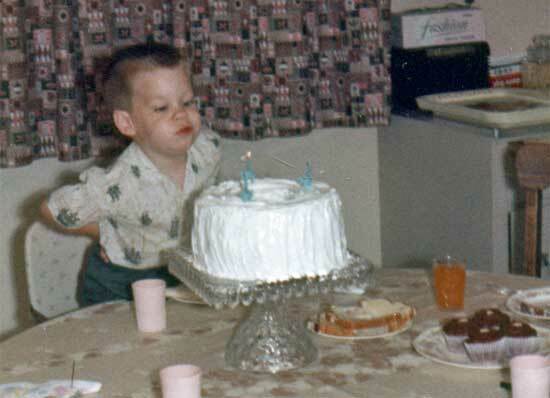 That’s my 3rd birthday above. The picture was taken in my grandparent’s kitchen at the farm. That’s the window where my grandfather stood and waved goodbye as we left. I remember the room well – the strange plate on the wall where the stovepipe had once gone, the smell of Old Golds new and historical, the hard taste of the well water from the taps, the overall sense of must and creakiness and things long set aside. China behind fragile glass doors and bowls of circus peanuts; Tinkerbell in color on Sunday nights. At some point I stopped wanting to go to the farm on Sundays; I was suffering from Sudden Onset Self-Addled Sullen Disengagement Syndrome, which strikes when you blow out 14 candles. I look nothing like this little guy; that picture looks like some mascot for a meatpacking company in the Polish District. Look at that curtain – it’s like the antithesis of a pleasant view. Outside streched green fields and endless sky; this curtain not only closed the view but suggested that such a thing was a mirage, and a dangerous one. It looks like some sort of sick dream you’d have with a bellyful of rotten Chicken A la King. To think my old Grandma bought such modern designs; makes you realize that the desire to be stylish and modern never ends with some. 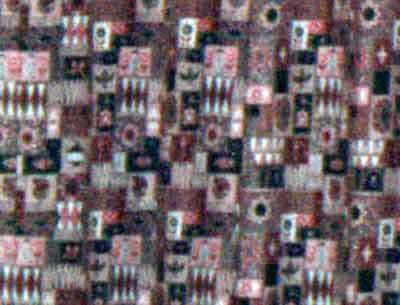 What about that pattern appealed to someone who grew up in the teens? And only one. We only had one, for that matter. Now I know where they came from: Grandma’s house. It was made by “Tri-State Plastic” of Henderson, KY. It was one of the things I kept when my dad was throwing out stuff for his move, and only because it had such potent memories. 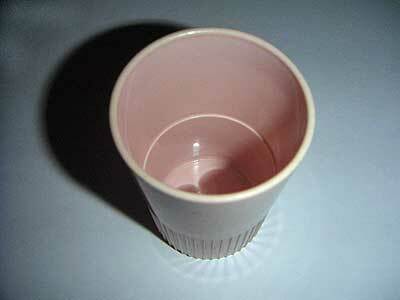 This was the cup my mother filled with warm salt water when I had a sore throat. Here. Gargle. How I hated that stuff. How I hated that cup. Or because the fourth glass in the set had already migrated to our house. I know, I know: so what? Who cares? 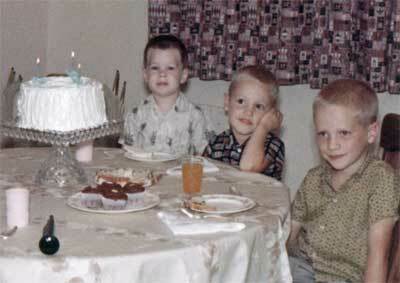 But here I sit 44 years later, looking at this picture, noting one glass missing, and holding it in my hand. The most annoying and useless things abide, sometimes. It gives them weight they never earned. But you don't hold that against them. But she was gone most of the day; I went to the office, had my picture taken for the column – one of those Dorian-Grey affairs where I suddenly age hideously before everyone’s eyes. It’s odd; I’m in better shape from the neck down than any time in the last ten years, but they balk at running headless torso shots, so all I can do is hope they use the healing tool on my mug. Back home; checked my mail, discovered to my horror that the Bleat looked like crap in Windows, fixed it; slammed together a bio for an upcoming conference appearance and photoshopped my own headshot for the brochure, wrote my monthly history piece for Mpls / St. Paul magazine, then stood outside on the porch and watched the weather with Jasper. A storm rolled in fast - great loud cracks and crashes, gouts of rain, wind with all the self-important fury of a 15 year old discovering Injustice in American history. It blew away quickly, but it changed the day, cooled it off. Then Jasper stood, raised his ears, and barked: someone was here. Someone indeed. My dad and his bride came down for my birthday, which gave the event extra zing. It’s nothing for him to drive down four hours and drive back in the same day; he did 500 miles yesterday in one of his semis, hauling fuel somewhere in South Dakota. He’s 79 and still has the energy of a puppy. We went to a nice little noisy pasta bar that used to be a gas station, then had cake at home. I probably ate more sugar today than I’ve had in six months; mm-mmm, it was good. I hooked up my birthday present – a speaker system for iPods and played 40s pop for the oldsters, who were tickled to hear the classics. Will Gnat remember him? Well, I hope so; may he live another 20 years. In any case I remember that kitchen; I remember Grandpa with his pants hitched up to his sternum, hat mashed on his head, wrinkled hounddog face, feigning surprise when the kids opened his birthday gift. 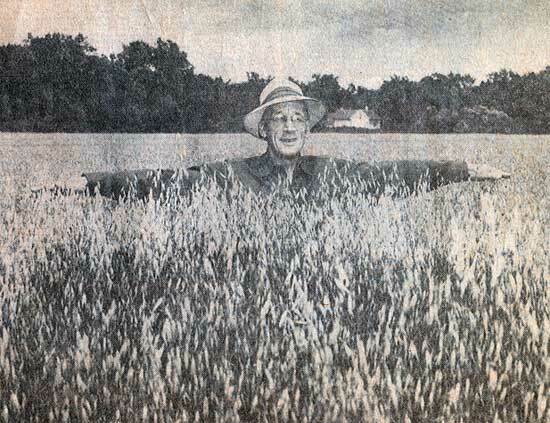 One year in the late 60s when the crops were good the Fargo Forum took a picture of the farmer, outstanding in his field. If he looks down on it today, this is what he sees. Thanks for the start, Grandpa; I’m in your debt, too. Also my Dad’s, who picked up dinner. One of these days he’s going to impress upon me the importance of changing the oil more often. One of these days I’m going to get him to tip 20 percent in the good joints where the napkins are thick. But not any day soon; may we all have these arguments forever.